It can be done but its more work, and on soft ground jacking up can be hazardous, especially if your car is not attached to stabilise the caravan. The method I described in my post Friday works fine. Get one or two pieces of 3/4" plywood and you will be fine. Its really easy. First decide whether this for use as a static or for towing. For towing you will need to get it safe and that means tyres brakes suspension tow hitch and lights must all be checked/ serviced. If its for use as a static (never towed) then those things don't matter. Many years ago we had one of those caravans. They were made with very little equipment but many were DIY fitted with fridges batteries lights heaters and water heaters. As you have told us you have no knowledge, I would get the basic safety checks carried out by a caravan fitter. You can find one by looking for an AWS registered fitter on the NCC web site. They have an Approved Workshop Scheme consisting of fixed workshops and also mobile workshops. The mobile workshop addresses are listed so you can make contact. I assume there is a boundary dispute. Is this a site with demarcation or a "free for all? Your mains power 230V AC is protected by re-settable overload and earth leakage devices. No replacement fuses are needed. 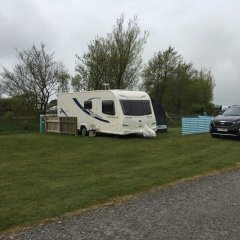 I have never owned an Elddis so cannot be factual but, the other brands are made so that a bike rack can be fitted by the dealer, or in the case of Swift, have the Thule mounting bars already fitted. I think you need to speak to your dealer as I doubt that Elddis would be any different to the other brands. Drum brake squeal is vibration. Brake drum castings sometimes distort and become tuned, so that vibration normally not heard can become noisy. Distortion of the drum and/or back plate can be down to marginal stability of the casting - not stable enough - perhaps lacking stiffness. Drums and brakes combined can resonate. Extra stiffening of drum and/or back plate can resolve the matter but it is difficult to experiment with any repeatable results with running production. Series production design changes are expensive and hard to justify. Al-ko has a captive market. I have known cases where the brake drum is distorted by the clamping force of the wheel fasteners. Simply taking a wheel off and replacing it in a different position, then torqueing up the fasteners can make a difference. As its such a simple thing to do, I would try this perhaps a couple of times. Not much point in economising really. A 25m length of 2.5 isn't much heavier, or cheaper. You have to laugh don't you? Just crack on with your holiday plans and don't worry about the politics. I have just changed to LV. Passed my 65th 10 years ago. As far as I know there is no significance to being 65 years old? If you are going to "full time" its better to do it legally so that the "world of consumerism" and you don't fall out. There are insurance companies providing specialist insurance for travellers. If you lie about the vehicle location to an insurance company, you risk losing heavily if you claim. We currently have a 360 but previously had a 3.0M. We had the side Net which comes with a ridge pole which clicks into the top of the two vertical poles. I added a centre pole which had a clamp in the top and clamps onto the ridge pole. A caravan of that size and weight could be difficult to manoeuvre with a single motor each side. Twin axle trailers resist turning so extra motive power is needed. It would be an expensive error to buy a single axle unit and then change it.